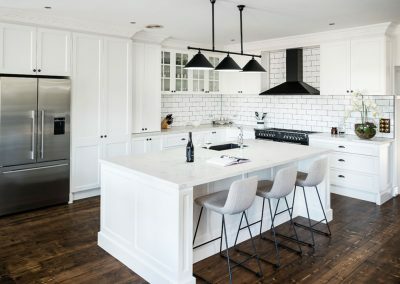 A simple yet efficient kitchen, this project features all the essentials with a contemporary take on country styling. 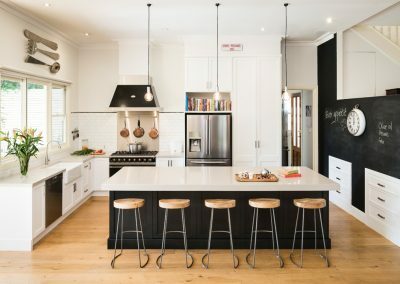 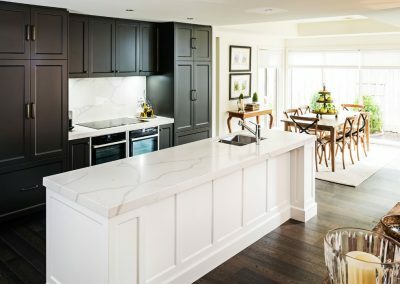 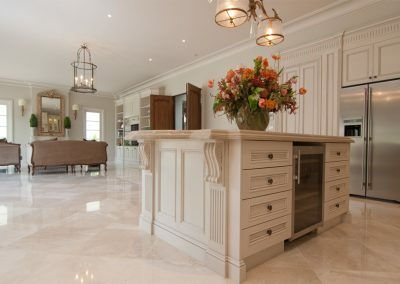 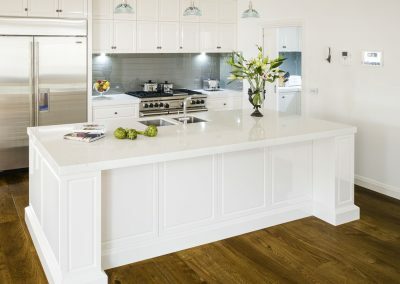 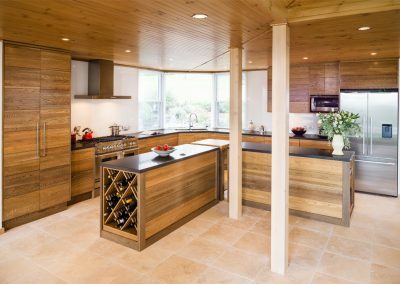 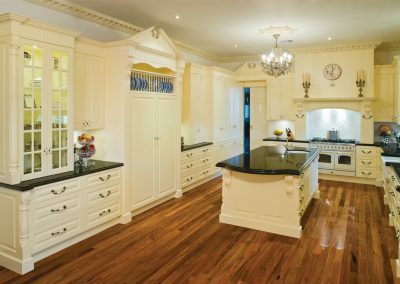 Designed by Laly Renehan, the layout consists of two runs of shaker cabinets that are topped with a tasteful combination of natural granite along the wall, and Tasmanian blackwood on the island. 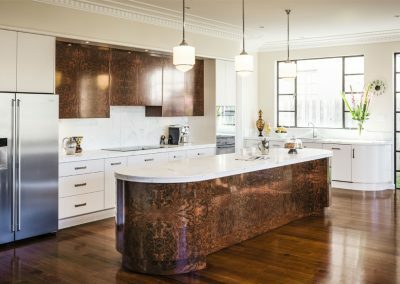 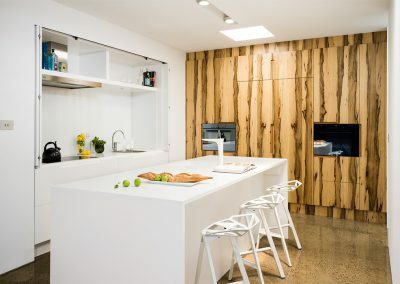 The large timber island benchtop was carefully selected for its impeccable colour and figuring, and sealed with traditional oil to mimic a piece of furniture. 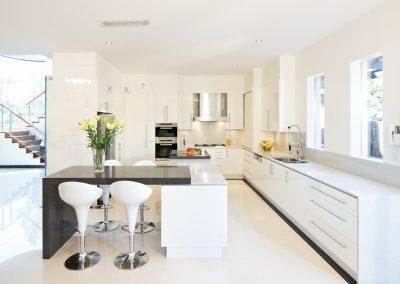 The modest, open layout with a soft neutral colour scheme creates a calming effect in the busy household. 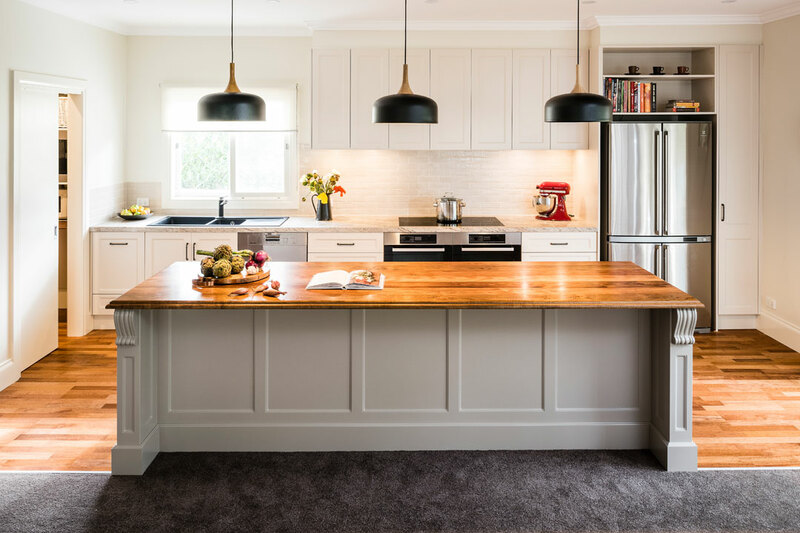 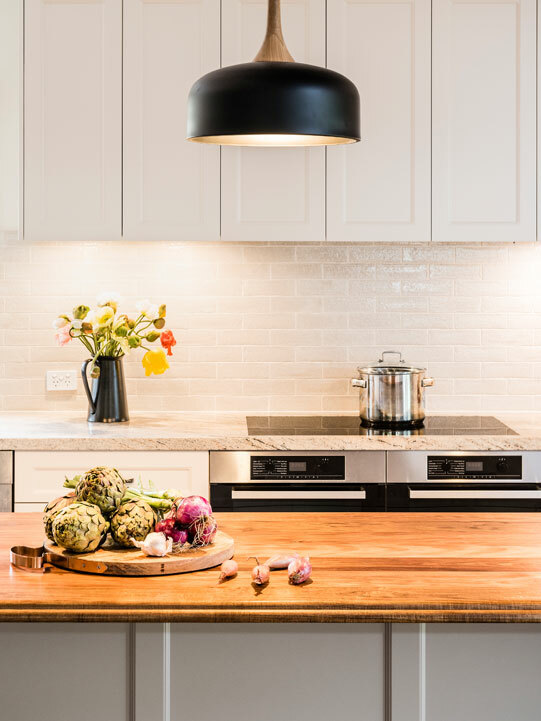 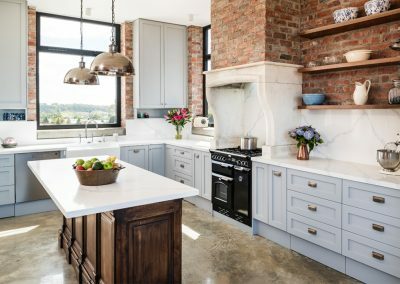 The owners – a busy professional banking couple with a live-in nanny for their two children – wanted an efficient streamlined kitchen that would work for large family occasions and informal entertaining. 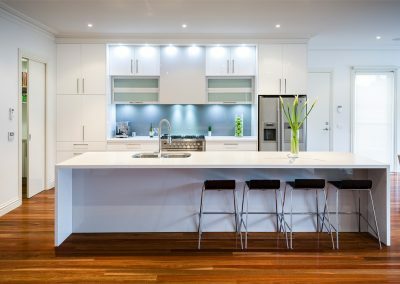 The classic, highly functional galley-style space perfectly suits the family’s needs. 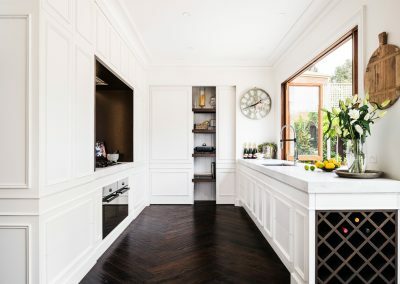 A butler’s pantry complements the functional layout of the kitchen and provides ample space for food storage as well as ease of accessibility, making meal preparation quick and effortless. 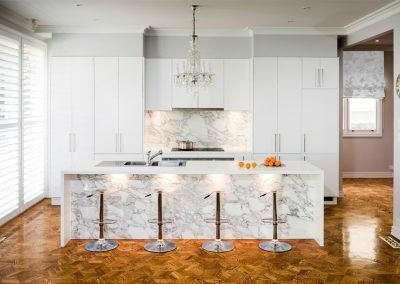 This project posed a significant structural challenge as Smith & Smith Kitchens was tasked with the removal of a long, angled stud wall that separated the kitchen from the living area. 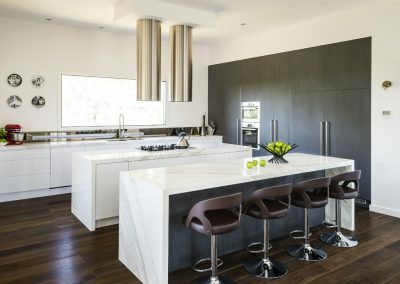 The successful removal of the wall transformed the two rooms into a cohesive open-plan living solution that is ideal for everyday family life and casual entertaining. 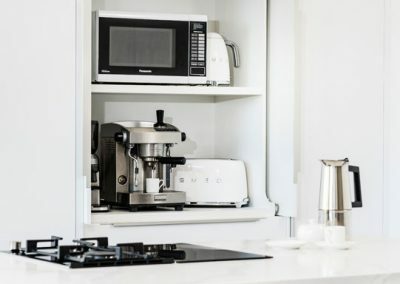 The addition of high-end appliances further enhances the kitchen’s usability, such as the Miele oven and cooktop, which are illuminated by LED under-cabinet lighting, and the Blum SERVO-DRIVE touch-to-open door for the Häfele One2Five bin combination. 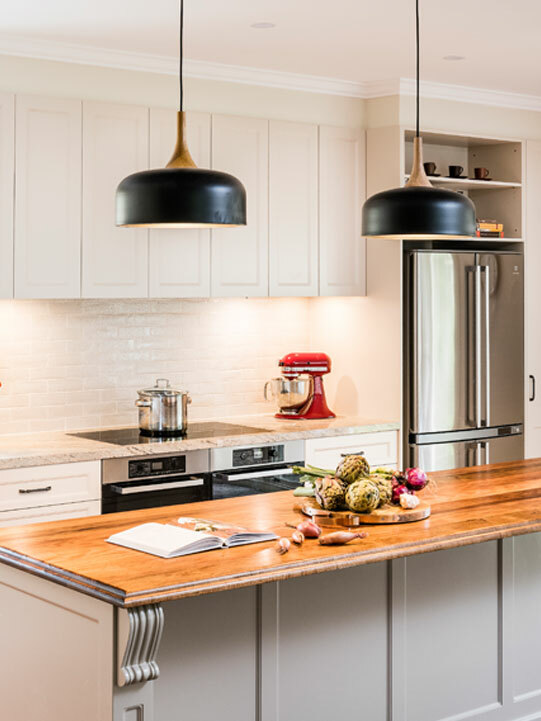 The cabinetry features Smith & Smith Kitchens’ two-pack polyurethane flat-panel doors with a satin finish. 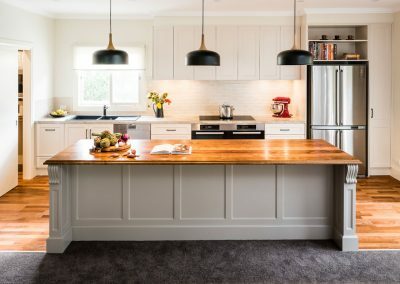 The cabinets adjacent to the wall are coated with Dulux ‘Light Rice’, while the island bench showcases Dulux ‘Puppy’, a soft grey that contrasts with the warmth of the benchtop and adds beauty to the space.